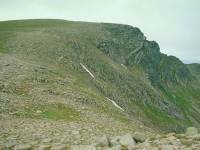 In the summer of 1980 I made a now familiar visit to the summit of Cairngorm via the chairlift, but in the mood for a bit of adventure I undertook what was to be my first proper mountain walk - eastwards along the rim of the Northern Corries to Cairn Lochan, down the eastern spur and back to the chairlift's bottom station via an established path. 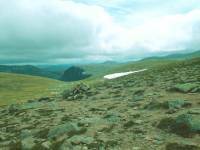 I ran out of film before reaching Cairn Lochan but I'm pleased with the photographs that I did get. Curiously there's no path at first. 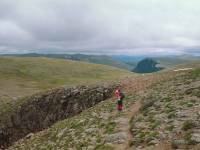 You just walk eastwards off Cairngorm's summit dome and pick your way down using the rounded stones as a natural stairway. Coire Cas (Steep Corrie) lies to your right and you reach a shallow col between it and the shallower Coire Raibert (Robert's Corrie) to your left. From here on there's a very significant path. 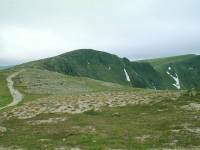 There's a very slight rise to Fiacaill a Choire Cas, and a ridge descending to the right makes a delightful return route forming a simple expedition. The main ridge now turns south to swing around the lip of Coire an-t Sneachda (the Snow Corrie). The path drops to a shallow col at 1099m, seen here. The path hugs the lip of Coire an-t Sneachda. 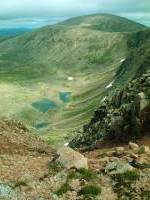 The corrie is about 1200m across but contrives to look much bigger. Its headwall faces north, which is why - as late as the year in July, when these pictures were taken - it still holds patches of snow from the previous winter. 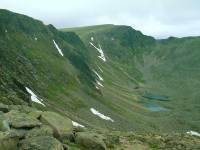 A cluster of small lochans lay in the corrie floor, and the opposite wall is formed of a ridge known as the Fiacaill Coire an-t Sneachda, the only terrain in the Cairngorms that is too tricky for the ordinary walker. 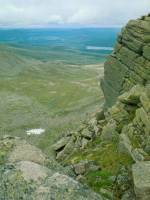 The lip of the corrie curves round to the east, and here Loch Morlich comes into view behind a wind-sculptured buttress of granite. This is the 1176m (3850ft) summit of Stob Coire an-t Sneachda, the highest point of the corrie headwall, and it's worth mentioning that this point is higher than all but fifteen of Scotland's principal mountains. Here we're about a mile southwest of Cairngorm itself, seen here as a gently rounded dome. The path drops to this col at 1111m elevation as it continues around the rim of the corrie. Here we're not far short of the Fiacaill Buttress, the top of a difficult scrambly ridge out of bounds to the ordinary walker. We mustn't forget the views in other directions. This southeastern aspect looks across the shallow depression of Coire Domhain, which slopes gently downhill at first then drops suddenly to the trench of Loch Avon, unseen from here. The obvious cleft just left of centre is Coire Etchachan, with Derry Cairngorm to its right, sloping away into Glen Derry. 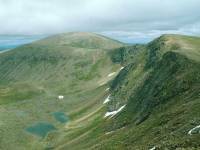 Coire Etchachan is 3km (2 miles) away. Adjacent to the top of the Fiacaill Buttress now, we can see right across the headwall of Coire an-t Sneachda from the western side. Cairngorm itself (1245m, or 4088ft) towers over everything. From just a little further round, the snow patches and Stob Coire an-t Sneachda are well seen. There is still a significant path here, testimony to the popularity of this walk. We've just passed the point where the path splits, the southern fork going off to cross the high plateau to Beinn Macdui. Here we see Coire Etchachan again, with Beinn Mheadhoin (pronounced Ben Vane and meaning Middle Mountain) rising to the left. The one shot I got of Coire an Lochain before the film ran out. Coire an Lochain is almost a repeat of Coire an-t Sneachda, a north-facing bowl hemmed in by a granite headwall and two descending ridges. 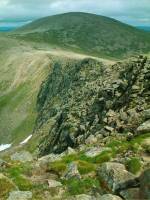 The flat summit up to the left is Cairn Lochan, 1215m or 3983ft, and is the highest point of the corrie headwall. 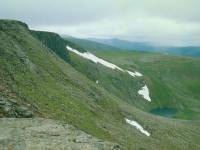 Carn Lochan is regarded as a "top" of Cairngorm but there has been something of a debate as to whether it merits being regarded as a principal mountain in its own right. If it were, it would be the tenth highest in Britain. Sgor Gaoith and Carn Ban Mor are just seen poking up behind the far ridge. 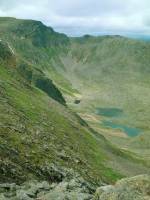 The Fiacaill ridge, separating Coire an-t Sneachda from Coire an Lochain. The difficult, scrambly pitch is not seen from here. I ran out of film here. 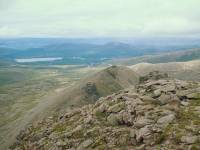 The remainder of my walk took me along the rim of Coire an Lochain and then down the northeast ridge of Lurcher's Crag to the corrie floor. The path back to the Cairngorm chairlift is straightforward except for the point at which it crosses the burn flowing out of Coire an-t Sneachda - the burn has to be jumped and this could be hazardous in wet weather.